Amazon said it never implemented the technology described in the patent, granted in 2016, and has no plans to. A patent Amazon has received would pair humans and machines. In this case, the humans would be in a cage. 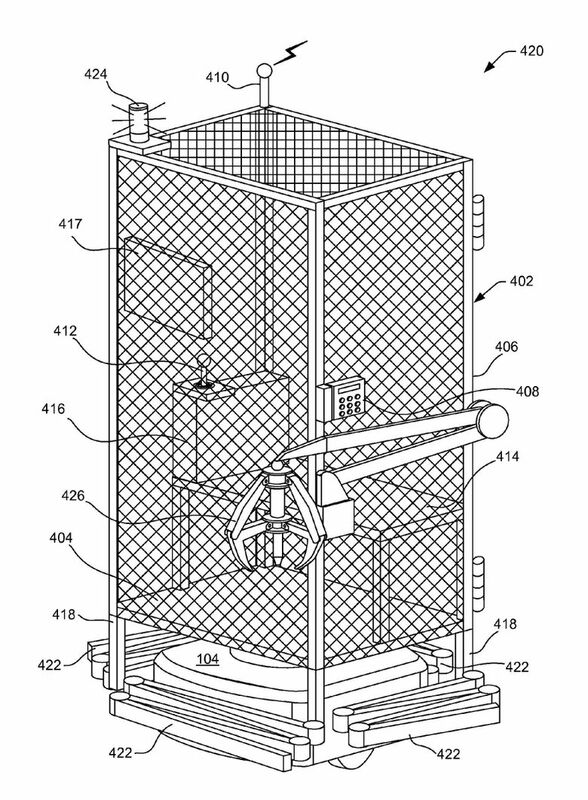 Illustrations that accompany the patent, which was granted by the U.S. Patent and Trademark office in 2016, show a cage-like enclosure around a small work space sitting atop the kind of robotic trolleys that now drive racks of shelves around Amazon warehouses. Amazon says it never implemented the technology and has no plans to, but the design appeared to be an effort to allow humans to safely enter robot-only zones in Amazon’s highly-automated depots to make repairs or pick up dropped objects. In an Amazon facility in Kent, for example, 750-pound robots topped with shelves scoot around an area surrounded by high chain-link fences, bringing merchandise like iPhone cases and coffee mugs to waiting employees who place or retrieve items from windows built into the fence. If an unauthorized human strays into the robot-only zone, the company says, an alarm is triggered and the devices are designed to shut down to avoid colliding with the person. Amazon, in its patent, suggested a way around that firm boundary between human and robot territory. “There may be circumstances where it is necessary for human operators to traverse, or otherwise go into, an active work space,” says the patent, which credits eight inventors in the Boston area, home of Amazon Robotics, which was formed through the acquisition of Kiva Systems in 2012. “Like many companies, we file a number of forward-looking patent applications,” she said. Many don’t see the light of day as finished products, particularly at Amazon, which encourages employees to experiment and invent. Such a cage-like device is not in use in any Amazon fulfillment centers, Campbell said. After this story was published online, Dave Clark, who oversees Amazon’s warehouses and logistics work as senior vice president of operations, weighed in on Twitter to say the company had no plans to use the contraption. Still, the company’s patents often spark conjectures about Amazon’s technology and business plans. Other Amazon patents have mulled using wristbands to track workers’ hand movements, dropping packages from drones 25 feet in the air, or having drones themselves link up to form a kind of floating warehouse. A reference to the cage patent appears in a lengthy case study of the various systems that make up Amazon’s Echo ecosystem, published Friday by Kate Crawford, a co-founder of the AI Now Institute at New York University, and Vladan Joler, a professor in the new media department at the University of Novi Sad in Serbia. Crawford is also a principal researcher at Microsoft Research. Amazon, in its patent, suggested using what it calls a human transport device to bring workers near robots for situations like repair or removal of a malfunctioning trolley, or retrieving items that have fallen off robot-controlled shelves. They could also be used to cut across an off-limits work space to reach a restroom that would otherwise be a significant trip on foot. And Amazon, which has turned an obsession with efficiency and business processes into an online retail and logistics empire, envisioned plenty of automation with its human transport device. In one scenario described by the patent, a robot that has failed could alert a computer system, automatically generating an order for repair, which it assigns to an available human transport device. Which device receives the order could be determined by its location, or the schedule or the particular skills of the human located within.